Allotments can use up a lot of time, so require some planning. Go for a plot size suited to your needs - half a plot is adequate for most people and ideal for beginners. This might need eight hours’ work a week for inexperienced gardeners, but half that for experienced ones. Pumpkins, squash, courgettes and potatoes smother weeds, so plant them in the weediest areas. Carrots, peas and onions cast little shade and weeds can quickly smother them. Onions are easily grown through weed-suppressing black membrane. Carrots can be grown in beds with paths to allow access for the repeated weedings required. Perennial crops such as asparagus and fruit need no cultivation or sowing, but must be planted in areas that are clear of all perennial weeds. It’s worth investing in a push hoe, a draw hoe, and a short-handled onion hoe to be fully equipped to deal with any weed problems. Sowing and raising plants soaks up the hours. To save time, consider buying in transplants. Nurseries offer a wide range of plants in cell trays. Sharing plants and exchanging plants with friends and neighbours makes sense and is likely to be cheaper. Soils, especially clay ones, are often impossible to work in wet periods and can be damaged if you try. The heavier the soil, the fewer days of the year it can be worked, and in wet seasons waterlogged soils can limit what can be grown. Raised beds enhance drainage and greatly extend the time when sticky soils are workable. If raised beds are not suitable, try digging the soil while it is dry in autumn. When planning your allotment year consider how much you will be limited if the season turns wet. Choose maincrop cultivars of peas, potatoes and carrots that give heavy yields even if sown late. 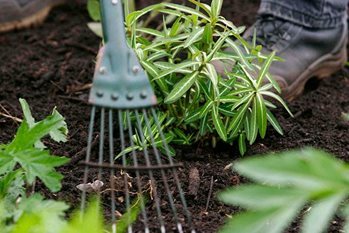 Where slugs are a problem, they will be at their most damaging in wet seasons, and second-early potatoes gathered before the soil gets too soggy and slugs too numerous are a sound choice. Sandy soils are workable most of the year, but dryness in summer, most often a problem in southern and eastern areas, can limit their productivity. In droughts there may be restrictions on water use; hosepipes and sprinklers are usually prohibited early in a drought but few allotment sites allow these. Plan for the possibility of periods without rain, especially if your plot has sandy soil. Avoid growing too many crops such as celery, leafy salads and runner beans, which suffer on dry soils. Choose root crops that are far less susceptible to drought. Squash, pumpkin and sweet corn are very resilient, and there are drought-resistant potato cultivars. Overwintered and early-sown crops do their growing while the soil is still moist from winter rains. Adding ample organic matter to the soil in winter also helps: one application of two bucketfuls of manure every square metre or yard will hold the equivalent of 5cm (2in) of rain. In late winter, rains should have restored the soil to full moisture levels, if they have not left it soggy, battered and emptied of nutrients. Skill with water, seedbeds, seeds, and fleece can still get crops off to a good start, although on difficult clay soils transplants raised indoors might be necessary. Getting plants going well before late spring is essential. Crops grow best during the long, warm days and high light levels of late spring to late summer, and for this they need plenty of leaves. Wet, but not too wet, summers are far better for allotments than hot, dry ones; crops need water to grow. and wet soil that cannot be dug before winter rains arrive. By early winter, the weather is of no consequence. The work of the allotment gardener is done for the year and they can relax in front of the fire and dream of a better spring.